Visiting my daughters’ bedroom, I noticed my oldest daughter had placed a number of pieces of paper under her sister’s upper bed. (The girls have a bunk bed.) They were placed in such a way that my daughter could read them as she relaxes or falls asleep. The pages, which she decorated with fun, colorful lettering, remind her to study, but she’s also put reminders to be nice to her younger siblings, clean her room, and some general advice to enjoy life. A friend of mine, who is also a wonderful masseuse, does something similar. Above the massage table she’s pasted the word “BREATHE.” (She moved away several years ago, but I still consider her “my masseuse” even though 2003 was probably the last time I actually had a massage…!) Whenever I found myself on her table, the reminder helped reinforce the need to let go and breathe. Affirmations provide encouragement and reminders for our lives. 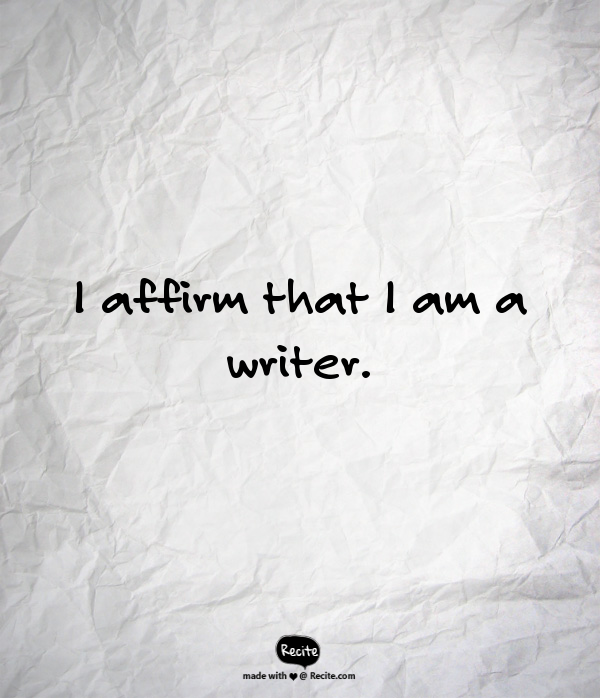 For years I’ve used affirmations for my writing and creative lives. Affirmations have helped guide me when I’ve felt directionless. Although I’ve bought books on affirmations, I’ve found that the best affirmations are those that resonate with me and are created by me. Just like my daughter, I know what I need, but I may need the affirmative reminders. Unlike my daughter, I don’t have the bottom of an upper bunk bed to place my affirmations. When I need a shift in my life, I will create a new affirmation. Sometimes I write an affirmation to underscore my confidence, while other times I use one to bolster my confidence. In 2015, I’m finding lots of days and ways to use affirmations. When I’m feeling stuck with my writing, I will write on a piece of paper “I am a writer” or “I am full of creative ideas” or "Agents will find me." In this way, my conscious world starts going to work on my subconscious world. I can look at them throughout the day or I can journal using the affirmations as a starting point. What is your take on affirmations? Elizabeth King Humphrey is a writer and editor living in North Carolina. She plans to continue procrastinating on making her annual writing plans until 2015 calendars are universally half priced. Elizabeth--To paraphrase the Kevin Costner film: If you say it, it will be true. I think that anything that can remind you of positive things in your life is a GOOD thing. I love that your daughter put those where she could see them before going to sleep!